There are Monsters and Gremlins out to gobble up your treats, Freedom Fighter! Except this fright night will happen 365 days this year if you don’t keep watch. Maybe you’re building your war chest, waiting for the opportunity to deploy massive capital. Or, you’re working your steady-as-she-goes savings plan every month. Maybe you’re just keeping that emergency fund full? Somewhere, you’ve got cash. Now some investors like fat stacks of cash – “cash is king” – and some people do not – “cash is a drag.” But hey – some trick-or-treaters like Snickers and some prefer candy corn. Whichever cash camp you fall into, one thing is true: you want the highest interest paid on your savings. Period. No Freedom Fighter is up for leaving money on the table! Up to now, only high rollers willing to park huge balances could expect to beat the usual anemic return on money left in a savings account. 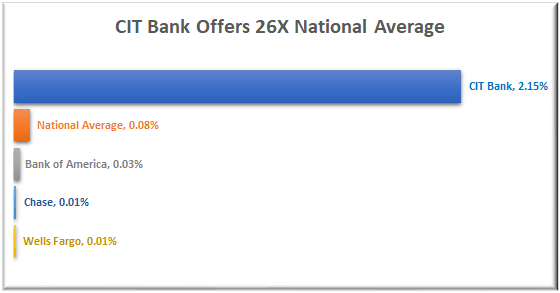 The typical 0.01% interest rate earned in regular US banks does no one any good. At that rate, you know you aren’t even keeping up with inflation. But how would you like to earn up to 26X that weak national average – even if you aren’t rolling in the stacks??? Now you can! I am super excited to share the CIT Bank Savings Builder Account offer with you. This is for you even if you, like me, are still in the building stage of your Financial Freedom. Finally, here is a way to earn this excellent interest rate on your savings without having to meet a ridiculously high threshold of initial or ongoing deposits. CIT is a fully FDIC-insured online bank that offers full digital access to your money 24/7. CIT doesn’t charge account opening or closing fees, OR monthly service fees! No brick and mortar means lower expenses for them, and higher interest rates for you. Clean and simple. Their 2.15% kills the typical bank. Use this GYFG special affiliate link to open an account with them. Two different paths ensure you the highest rate possible: an initial deposit of $25K, OR just $100 deposited every month. Your choice! Yes, you read that right: you can deposit $25K to capture this interest rate, but you could also choose instead to make just steady $100 per month deposits (after your initial deposit of $100) to take advantage of an interest rate 26X the national average! I am a huge fan of automating everything, so for me, this is a no-brainer: initial deposit, and then set up auto deposits of $100 every month. This is a perfect example of incremental action made on a regular basis resulting in big gains. Whether you shift over your wheelbarrow full of Benjies or simply open a CIT account with as little as $100, you will want to take advantage of this great opportunity offered to GYFG readers. Jump on it while you can! I’d call this “Treats with no tricks!” Fight for your Freedom, GYFG-ers, and get out there with a big ol’ pillow case to collect your treats interest. Sign up now for the CIT Bank Savings Builder Account GYFG offer and watch all the stacks grow!